After the recent blood spurting from wound and ominous clot incident, the surgeon decided it would be good idea to open things up and 'hoover' out the clot. I am not sure if hoover is the technical term, the mumborg quite possibly made that up.Hold the phone! Hoovering is not that far from the truth , 'suctioning' or 'vacuming' are both terms used in that procedure, so she wasn't that far off. So from midnight last night she has put on nil by mouth, as per usual when its the night before a surgical procedure. Fast forward to visiting time today and it turns out, that after many hours of deliberation (and nil by mouth), they decided to forego surgery for awhile and see if some heavy duty bandages would stop the blood loss. If so, they will then figure out what to do about the clot, if its still a problem. 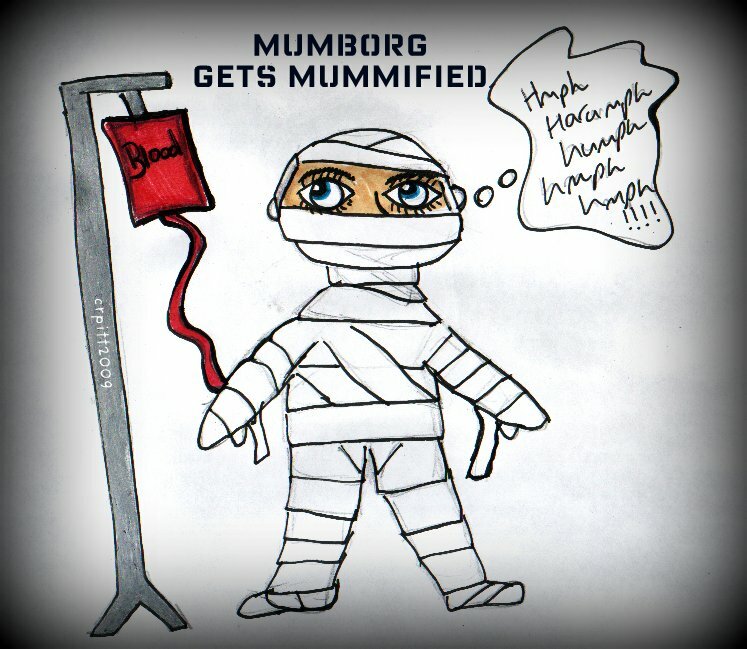 The already anaemic mumborg needs some more blood for now and some IV antibiotics to ward off evilness.While the mumborg is not quite mummified, its not far off. If a mumborg loses her bandages, how long does she have to stay in the hospital? After all that I certainly hope they finally let her have something to eat - the poor thing! They need to make up their minds and get your Mum fixed so that she can go home and make you some more lists! I'm sending good thoughts and prayers your way, Claire! Your mummy does seem to be having a rough go. Haven't those physicians ever seen "The Mummy's Revenge". They better get her fixed up soon or there will be heavy curses involved that would make King Tut envious. Pure silliness, but take heart. We are all rooting for both the mumborg and you. I hope the Doctors figure out what is going on, so all this crap can stop!! Geeesh! For some reason, your blog wouldn't load for me yesterday but I knew something was up. It is so wrong for your poor mum to have to go through all of this! Sheesh! I certainly hope the docs are getting their act together and getting your mum well, once and for all! I'm sorry Mumborg is still battling the bleeding wound. I hope they get this taken care of soon. She truly deserves a break on this... you too! Big hugs and healing vibes. what a a palaver, ugh! sending healing vibes.